Location: Gower Point, Sunshine Coast BC. new owner and loving it! Apparently 6 volt plugs heat up quite a bit faster then 12 volt plugs, hence the shorter cycling time. I think mine takes about four seconds. The 12 volt system on newer versions of this same engine do supply voltage to the plugs after the engine has started. If you have a digital multimeter [ less than $20 at Cambodian tire]. you can check the voltage to the plugs whilst you start and warm up your [cold] engine. you are not alone. I noticed mine does the same thing. I just got mine and was woundering the same thing. I will show my mecanic buddy and get his take to. Hi, Guys, its normal for this Mitsubishi delica engine. this engine dont like cold weather. 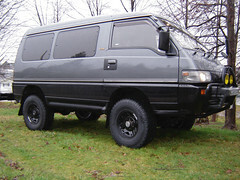 i test many delica & pajero & do same thing. this is just a bad design By mitsubishi for the glow plug system. you just have to deal with it. just give gas a little bit when the relay start clecking on & off & wait until 10-15 second until it lock. the glow plug relay will cut off the power in the relay. then you could release the pedal for normal idling. HI, I see your problem. in your case the best way is change the 2 glow plug relay that is located under your driver seat. there is 2 relay shape is like a round with 2 outlet & a center plug & screw on it. maybe worn-out since it has a magnet inside this relay.old relay or antifreeze sensor located on top of the cylinder head beside the first injector. but first try the relay. it might work for you. if you need help for relay i can get you one from japan. cost maybe 100-110 each. hope this help. Like Mardy says this system is quite sensitive. Any high resistance in the cicuitry is bound to give greif. The relay contacts can burn if they are not clean and any minute amount of corrosion in the connections and wiring may cause the controller to behave abnormally. If you change your coolant make sure you get ALL the air out of the system.I don't think the temp sensor probe is located where you might get an air pocket, but there is an air bleed screw on the thermostat housing. 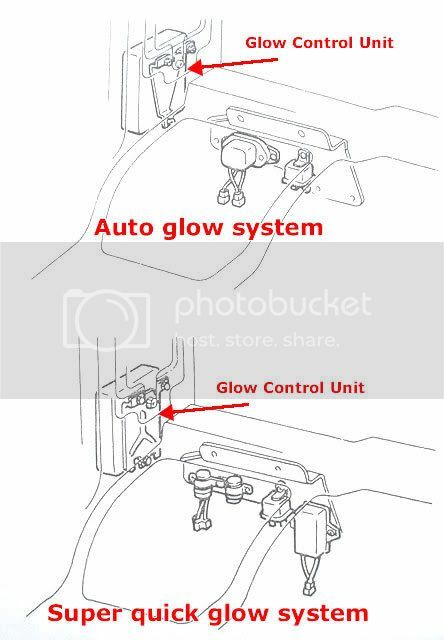 There are actually 3 different types of glow plug control system on L300's! Last edited by Mystery Machine on Wed Feb 21, 2007 2:03 pm, edited 1 time in total. most of the delica here came from japan & mostly as i see many delica i fix has a quick glow plug system. you are right it has 2 system but most of this delica has 2 relay as you show the picture.its a super quick glow system. technically not easy to fix . somebody has to know the system before he can fix it. like Me & argo says maybe corrosion ,contact & relay. this vehicle sometime burn the relay when they ship the car from japan port to Van port most delica has a bad battery.so people who put this van to the ship boost the battery & sometime they over volts the system & burn the relay or ECU. this glow plug system is very sensitive. i did change one ECU for delica already with 60 kms on it.after all the things been change. so its not easy. we dont know what happen to this car when they do transport. its not easy to find the fix on this. also its old car.anything could go wrong.